Heat a pan and add the chickpea powder /besan and dry roast on low heat for about 3-5 mins. The powder has to be constantly stirred so that it does not get burnt. Add the roasted chickpea powder to the noodles and mix it properly. You will notice that the noodles will start separating when you add the roasted powder. Add the chopped chicken, onions, coriander, green chillies, salt, boiled eggs and ajinomoto to the noodles and mix well. In a pan heat the oil and put the gas off. In the heated oil, add the coarsely grinded red chilli powder and mix. Immediately pour the chilli oil on top of the noodles. Mix all the noodles and chilli oil well and add the lemon juice. At this point, salt, chilli and lemon can be adjusted according to your taste. 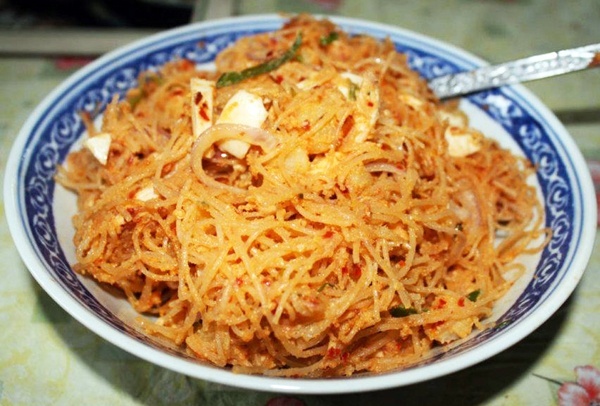 This entry was posted in All Recipes, Chicken, Salads, Snacks & Appetizers and tagged glass noodles, mung bean, phing by Kamakshi. Bookmark the permalink.